Mumbai: Mumbai held tearful memorials and police staged a show of strength on Thursday as India’s financial hub marked the first anniversary of terrorist raids that killed 166 people and ratcheted up tensions with Pakistan. While emotionals onlookers waved Indian flags and banners with slogans such as “End The Violence", police commandoes with new weapons and armoured cars tracked the route the 10 terrorists took for an attack that stunned the country. 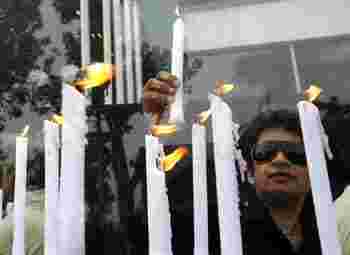 Other residents lit candles outside a Jewish centre, one of several sites from luxury hotels to the city’s biggest railway station, that were targeted by the Pakistan-based militants in a rampage lasting three days. “We just wanted to show our support and show that we care," said Subir Kumar Singh, who was leaving a written message on a banner outside the Leopold cafe, a popular tourist spot that still has bullet marks from the attacks. The raids highlighted the lack of preparedness of India to terrorist attacks and showed how regional tension in South Asia could undermine stability in Asia’s economic powerhouse as it emerges on the global stage. 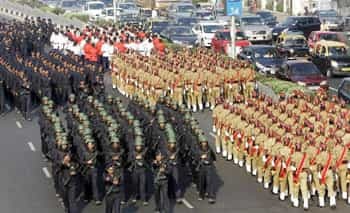 The police march was aimed at trying to show they were now better prepared. Many police, some armed with only sticks or old rifles, were reported to have fled the attackers who used grenades and automatic rifles. Nine terrorists were killed by police in the attacks. The lone survivor, Mohammad Ajmal Kasab, is on trial and could face the gallows if found guilty. Many foreigners, including US, British and Canadian nationals were killed. Some local residents shouted “Hang Kasab" as they walked past the seafront Taj Mahal Hotel, where the terrorists guided by handlers in Pakistan by telephone, battled commandoes for nearly three days through a myriad of plush corridors. “The first thing I did today was go to the temple and pray because my life was saved," said Mukesh Agrawal, who was wounded at the city’s main train station. “(I) pray that something like this will not happen in my city. I am going back to the station tonight to see the place. It’s been a year, but I remember everything." As a groundswell of emotions swept the city, Indian newspapers and TV stations indulged in a painful public soul-searching in chat shows, debates and editorials. “26/11: lest we forget" -- read a front-page editorial in the Mint newspaper. New Delhi has sought to bring international pressure on Islamabad to act against terrorists operating from its soil, including the Pakistan-based group Lashkar-e-Taiba (LeT) blamed for masterminding the raids. “The government of Pakistan could do more to bring to book people who are still roaming around the country freely, to dismantle the infrastructure of terrorism and I can only hope that there will be progress in that area," Prime Minister Manmohan Singh said this week in Washington. In a move seen as trying to appease that frustration as well as deflect US pressure to act, a Pakistani court indicted on Wednesday seven Pakistani suspects on terror charges in connection with the attacks. In Mumbai, police officers said their show of strength was a message of confidence for the city residents. “We wanted to tell the people that Mumbai is safer," Rakesh Maria, the chief investigator in the attacks, told Reuters. “When I look back, the only thing that rankles is the loss of so many lives. If only we could have prevented it." At Nariman House, a Jewish centre in a south Mumbai alley, Rabbi Yehuda Krinsky lit candles and read sacred verses on Wednesday in memory of six Jews killed by the militants. The centre has been shuttered since last November, its windows draped with plastic sheets, its walls and tiles still pockmarked and shattered from the fierce gunbattle. “It brings back images of the Holocaust," said Krinsky, chairman of the orthodox Jewish movement’s international centres.